Walmart steps up HUGE for the coming year, offering up a 200 dart pack under their “Adventure Force” brand, already filled to the brim with dart blasters. The darts take cues from the K’Nex K-Force blasters, and compare in shape to other “waffle” style darts available on Amazon. This is only the first product of the blaster related items for 2018 from Adventure Force, and if last year was any indicator there are big things coming for this year. Dart Zone, through Walmart’s Adventure Force label look to push a quality blasting experience without the premium cost. And with the incoming prices for the next year in other brands, a little relief on the wallet might be just what parents are going to want when it comes time for gift-giving. Big thanks to Dart Zone for sending along a sample of the ammo, really looking forward to using these in play! My judgments are based on cursory testing of the darts from a few shots, naturally as I get to use these more I’ll have a stronger opinion (opinions also remain my own, even with a provided sample). From what I’ve seen so far though, it’s good, it’s pretty good. The Adventure Force waffle darts are in the center, green with blue tip. Zuru darts, while slightly cheaper, are still shorter than most darts. A quick search on Amazon.com shows some of the first results are 200 darts of various 3rd parties for $10+, Walmart will sell these 200 dart packs for less at the $9.97 USD mark they set. The Dart Zone Sureshot package for sale on Amazon is 100 darts for $14.99, not the same value as the Walmart pack. Make sure to shop “Adventure Force” at Walmart and you can be confident that you are buying darts safe from an established company that will ship appropriately and promptly for one of the best prices out there. Zuru makes a slightly cheaper 500 pack for $24.99, but those darts are shorter (shown in the first pic above) which can be a problem for some players (depending on the type of blaster they’re using). So yes, the value is close but the dart length makes it a gamble on whether your blasters will work (if your blasters use magazines, this could affect reliability feeding. Front-loaded blasters obviously are less troubled by dart length than blasters that use magazines. 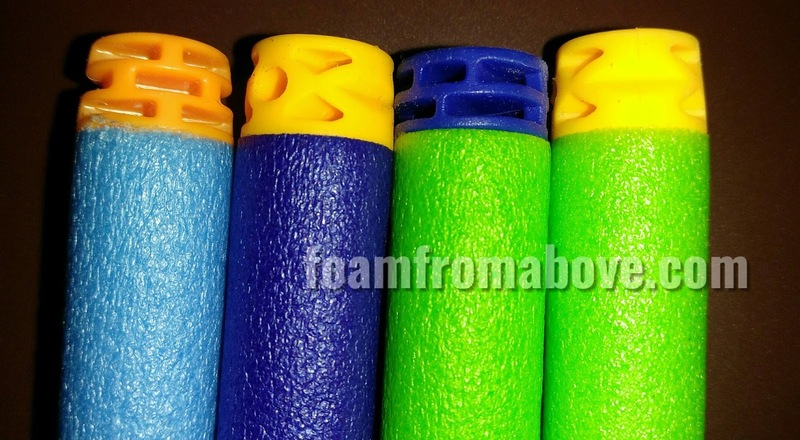 As I stated before, the bonus of buying through Adventure Force is that one of the companies making the products for the Adventure Force line, Dart Zone, is an experienced and established blaster/toy company, not just a listing on the internet. You know the BallistixOps line, the Dart Zone chain blasters (Enforcer, Dart Storm, Light Command) in recent history, and their dart making has hit some leaps and bounds since they first appeared. Some people know the third party brands they trust but this pack remains competitive even with some of those. If you need to make a run on ammo in a pinch, just run out to the store and not have to worry about waiting for shipping. 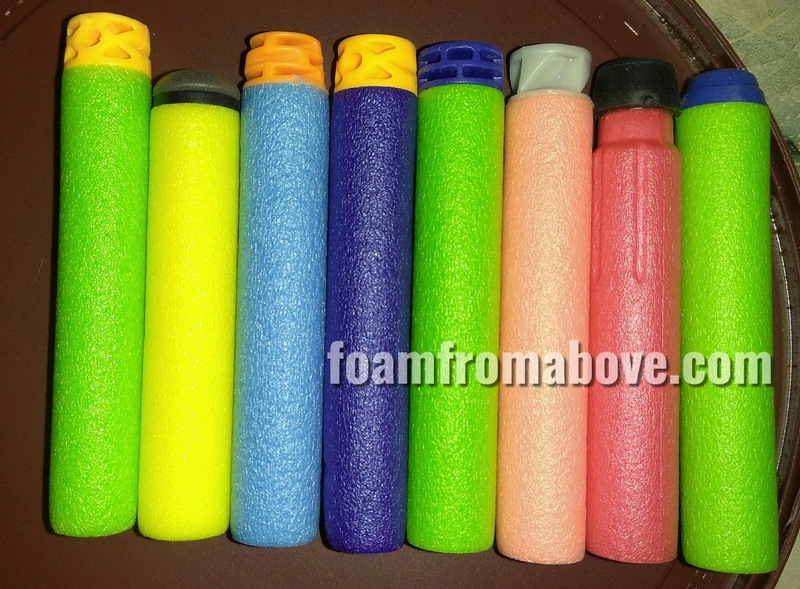 The foam of the Adventure Zone waffle darts are on par with anything else I’ve used as far as foam dart ammo is concerned. It did feel a bit too squishy trying out the front loading of a Tri-Fire, but ultimately the darts fired just fine, they loaded well. Durability will really test during summer play, or hopefully in an arena somewhere. Definitely no complaints from me regarding the shape, the feel, or the flight path of the darts. The video above illustrates some of my findings firing these out of stock blasters. The darts were impressive! I had maybe one ricochet off a wall, but for the most part the darts all stayed within the center and grouped in the middle of the hallway. That’s a far cry from some other darts that fly every which way; maybe far distances but definitely nowhere near what you want to tag sometimes. It’s a promising start for the first item of Adventure Force for 2018, coming from Dart Zone. Looking forward to what the summer reveals will bring! If you liked the video, please be sure to like and subscribe, I’d appreciate it! Do you like the Ekind, or the Adventure Force darts in terms of performance and accuracy?